Figure 6.4. 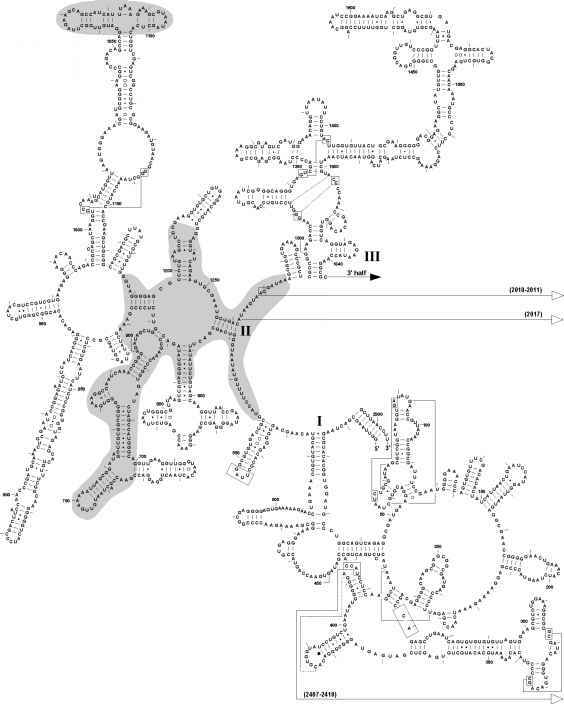 Traditional secondary structure of E. coli 16S rRNA hairpin 416-427, and schematic diagram of its UUCG tetraloop conformation. (G. Varani, C. Cheong & I. Tinoco, Ir., Biochemistry 30: 3280-3289, 1991; F. H.-T. Allain & G. Varani, J. Mol. Biol. 250: 333-353, 1995). Figure 6.5. Secondary structure model for E. coli 23S rRNA (see). The universal core is shaded, and the most variable regions are shown in boxes. (R. R. Gutell, M. W. Gray & M. N. Schnare, Nucleic Acid Res. 21: 3055-3074, 1993. See also the legend to Figure 6.1 for details and references). pseudoknots in the E. coli 23S rRNA secondary structure (see Fig. 6.5); most of them are localized near the inter-domain regions, as in the case of the 16S-like rRNAs. Domains I and III have not been found in small mitochondrial 23S-like rRNAs. That is why the nucleotide sequences of these domains are not included into the universal core of 23S and 23S-like rRNAs presented in Fig. 6.5. All main functional sites of the large ribosomal subunit determined by genetic studies were localized in the universal core of 23S-like rRNAs, and no mutations affected the ribosome activities were found within the variable regions. Interestingly, the modified nucleotides in both prokaryotic and eukaryotic 23S-like rRNAs are clustered mainly in domains II, IV and V, that are the most functionally important domains of 23S-like rRNAs (see below, Sections 9.3 and 9.4). Figure 6.6. Secondary structure models for 5S rRNA. (N. Delihas, J. Andersen & R. P. Singhal, Progr. Nucleic Acid Res. Mol. Biol. 31: 160-190, 1984. See also the text for details). A, a generic prokaryotic 5S rRNA; positions that can be occupied by any nucleotide residue are indicated by stars. B, a generic eukaryotic 5S rRNA; positions that can be occupied by any nucleotide residue are indicated by stars. domain in the large ribosomal subunit. However, it seems to be premature to consider the 5S rRNA as a part of the rRNA universal core of the large subunit since 5S rRNA coding sequences are absent from mitochondrial genomes of fungi, protozoa, algae and animals, and the question whether mitochondrial ribosomes in these organisms can function without 5S rRNA or they utilize somehow nuclear-encoded 5S rRNA remains to be open. The model for secondary structure of 5S rRNA was proposed by Fox and Woese (1975) entirely on the basis of the comparative phylogenetic analysis (see Section 6.3.1). Since then the model has been verified in numerous studies, mainly by chemical or enzymatic probing and NMR spectroscopy, and had not undergone any serious alterations. A recent generalized version of this model (the so-called three-stem model; Fig. 6.6) contains five helices (I-V) and five single-stranded elements consisting of two internal loops (B and E), two external loops (C and D), and one joint loop (A) that serves to connect helices I, II and V. The 3' and 5' terminal sections of 5S rRNA are base-paired forming a stem. The helices II and III have conservative one-nucleotide and two-nucleotide bulges, respectively, that are believed to participate in RNA-protein interactions. As seen from Fig. 6.6, several base pairs and some nucleotide residues at the equivalent positions are also highly conserved throughout the evolution. The major part of the universal 5S rRNA secondary structure, however, is organized from quite diverged sequences. On the whole, the 5S rRNA gives us a very impressive example of correctness of the general principle of organization of rRNA three-dimensional structure that has been formulated above, in Section 6.3.1. The recent X-ray crystallographic analysis of the 3'/5' terminal stem of T. flavus 5S rRNA has proved that helix I has the classical A-conformation. NMR studies of the E. coli 5S rRNA fragment containing loop E have shown once again that single-stranded regions in RNA molecules may have rather well ordered structure. In particular, the loop E appears to resemble a double helix but formed by non-Watson-Crick base pairs such as G:G, G:A, reversed Hoogsteen A:U, and G:U stabilized by a single hydrogen bond (Fig. 6.7). Figure 6.7. A model for three-dimensional structure of loop E of E. coli 5S rRNA as determined by NMR spectroscopy: a stereoscopic view (see the text for details). (A. Dallas, R. Rycyna & P. Moore, Biochem. Cell Biol. 73: 887-897, 1995). Combination of chemical, enzymatic and physical approaches led to the conclusion that much of the double-helical structure in rRNAs of all types is similar in solution and within ribosomal particles. In other words, although some alterations in conformations of rRNA regions involved in interactions with ribosomal proteins were detected (mainly by CD spectroscopy), one can argue that the intraribosomal secondary structure of rRNA is known in all major details. (1) Within the ribosome, rRNAs are folded in a compact way, and the internal part of ribosomal subunits is represented almost entirely with their RNAs that form the so-called rRNA core. (2) The overall shape and size of the isolated (naked) rRNA in solution can be similar, under certain conditions, to those of the corresponding ribosomal subunit. (3) Three-dimensional structure of rRNA in the ribosome can undergo alterations (conformational changes) probably related to ribosome function. In addition, several well-conserved tertiary Watson-Crick base pairs have been found by the comparative analysis of rRNA sequences (shown in secondary structure models for both 16S-like and 23S-like rRNAs; see Figs 6.1-6.3 and 6.5). 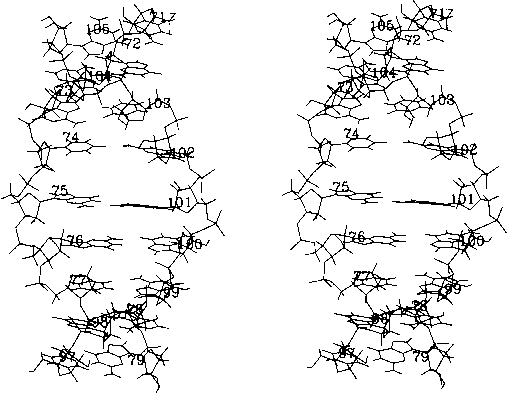 It was already emphasized that macromolecular size and shape of rRNA as well as any other single-stranded RNA strongly depend on ionic strength, mono- and divalent ion concentrations, pH and temperature (Spirin, 1960, 1964). rRNA can adopt conformations ranging from completely unfolded threads (at zero ionic strength, high temperature or low pH) to tightly folded coils (at high ionic strength and in the presence of Mg2+). The electron microscopy studies showed that at low, but not zero, ionic strength rRNAs can acquire an intermediate, strongly elongated (rod-like) conformation that still retains a substantial fraction of their secondary structure. The systematic comparison of the size and shape of isolated high-molecular-mass rRNAs and ribosomal subunits by sedimentation analysis, light, X-ray or neutron scattering and diffusion coefficient measurements (see Vasiliev et al., 1986) showed that at Mg2+ and monovalent ion concentrations optimal for ribosome function in vitro (about 5 mM MgCl2 at 100 mM NH4Q or KCl) the isolated rRNA are much less compact than within the ribosome. Neutron small-angle scattering measurements with variation of contrast (allowing to estimate rRNA parameters within the ribosome, see Section 8.1) have demonstrated that under these conditions the radius of gyration (Rg) for the RNA core of E. coli 50S subunit (6.5 nm) is almost twice less than that for the isolated 23S rRNA in the same solvent. In accordance with this, under the "physiological" ionic conditions the E. coli ribosomal subunits, despite their higher molecular weight and lower net negative charge, have a greater electrophoretic mobility in polyacrylamide gels than corresponding rRNAs. It can be expected because a mass of basic ribosomal protein interacting with rRNA in the ribosome should strongly contribute to ionic atmosphere of the RNA. Yet, the external ionic conditions can be selected to maintain a compactly folded state of isolated rRNA in solution (Vasiliev et al., 1986). These conditions include relatively high Mg2+ concentration (about 20 mM), elevated ionic strength (0.3 to 0.5), sometimes the presence of di- and polyamines and alcohol. It is noteworthy that the same conditions are optimal for in vitro reconstitution of ribosomal particles from rRNA and ribosomal protein (see Section 7.6.2). Under these conditions the isolated rRNA acquires a compact conformation approaching that in the ribosome. Nevertheless, the compactness of the isolated rRNA does not fully attain that of the rRNA in the ribosome: the radius of gyration (Rg) of the isolated rRNA in the compact form in solution is still one-fourth larger than the radius of gyration of the rRNA in situ. The diffusion and viscosity measurements also point to a more compact way of rRNA folding within the ribosome than in the free state. Thus, ribosomal proteins may exert not simply ionic effects on rRNA, but probably impose also additional constrains on rRNA folding. In the late 1970s Vasiliev and co-workers provided evidence that the isolated rRNA under the conditions when it acquires the compact state folds into particles with a shape similar to that of the corresponding ribosomal subunit (Fig. 6.8). Both 16S and 23S rRNAs of E. coli prepared in a buffer containing selected salt proportions were studied by electron microscopy. The shapes of these rRNAs were found to differ sharply from one another. 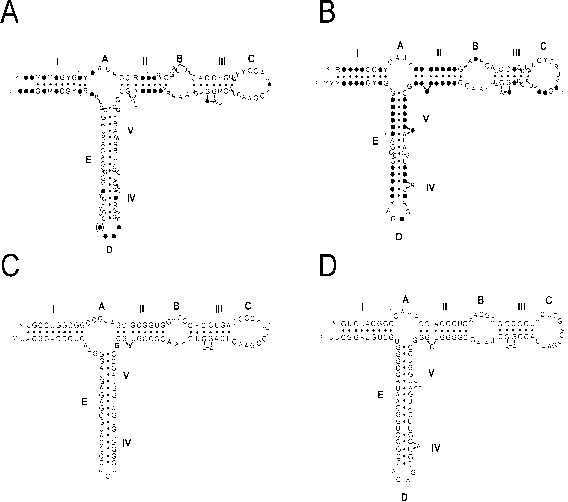 A substantial fraction of the 16S rRNA molecules had a specific Y- or V-like configuration and was similar in the overall shape to that of the 30S subunit (Fig. 6.8 A). On the other hand, the 23S rRNA images resembled those of the original 50S subunits: they had a characteristic central protuberance with smaller protuberances on either side (Fig. 6.8 B). 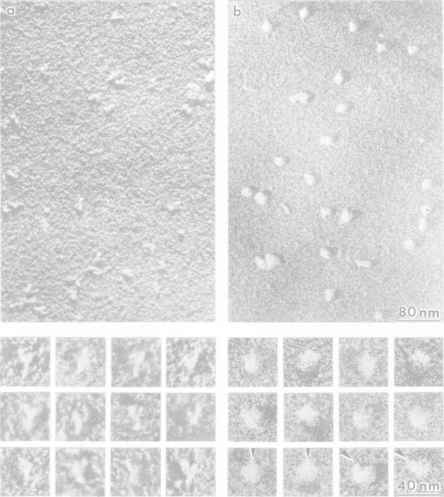 The conclusion was made that the general patterns of compact rRNA folding observed by electron microscopy with isolated rRNA samples anticipate the major morphological features of the ribosomal particles. Figure 6.8. Electron micrographs of E. coli ribosomal RNAs in compact conformations: General views and galleries of images. Specimens from proper solutions were freeze-dried and shadow-cast. A: 16S RNA. Y-like and V-like particles are seen. (V. D. Vasiliev, O. M. Selivanova & V. E. Koteliansky, FEBS Lett. 95: 273-276, 1978). B: 23S rRNA of E. coli. The arrowheads indicate the location of the central protuberance in the crown-like region of roughly hemispherical particles. (V. D. Vasiliev & O. M. Zalite, FEBS Lett. 95: 273-276, 1980). (Original photos of V. D. Vasiliev). Figure 6.9. Computer-graphical representation of the three-dimensional reconstruction of the 70S ribosomes in stereoscopic views. A: View from the solvent side of the 30S subunit. B: View from the solvent side of 50S subunit. & S. Srivastava, J. Cell Biol. 115: 597-605, 1991). rRNAs. First, the use of element-specific (spectroscopic) electron microscopy revealed the distribution of phosphorus, and therefore of RNA, in the ribosomal subunits in situ (Korn et al., 1983). 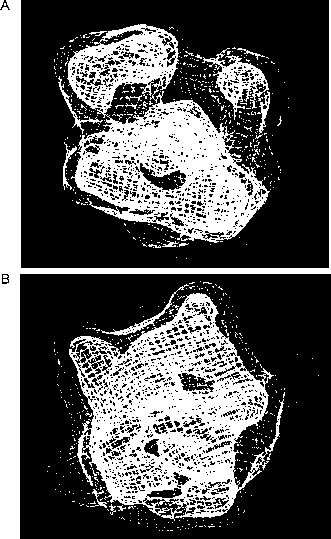 Second, more recently the method of cryo-electron microscopy in conjunction with the random-conical image reconstruction technique (see Section 5.5) was applied to study E. coli 70S ribosomes and showed the spatial distribution of high-electron-density material, presumably RNA, within the particles (Frank et al., 1991). 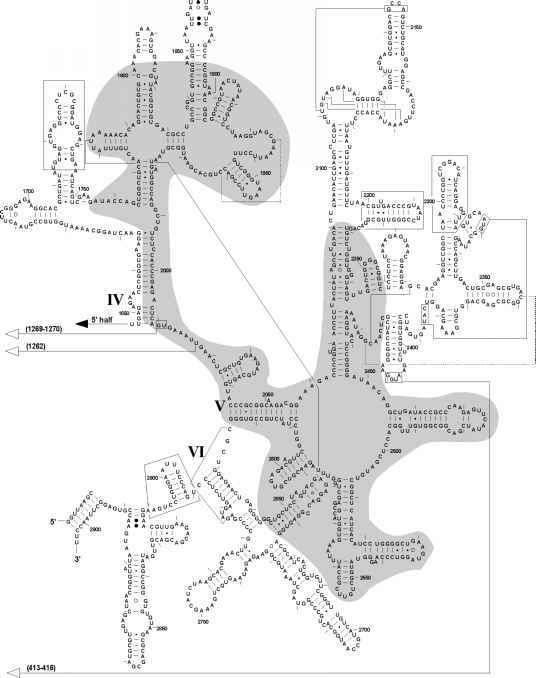 In both cases the RNA component within the 30S subunit was found to have an asymmetric Y-like (or V-like) shape similar to the electron microscopic images of the isolated 16S rRNA in a compact form, as earlier described by Vasiliev et al., and well fitted the subunit contours (Fig. 6.9 A). In the case of the 50 S subunit, the shape of their RNA component was much more isometric, characterized with three reduced protuberances and also nicely inscribed into the subunit shape (Figure 6.9 B). Thus, rRNAs have been shown to be capable of specific self-folding into compact particles of unique shapes. 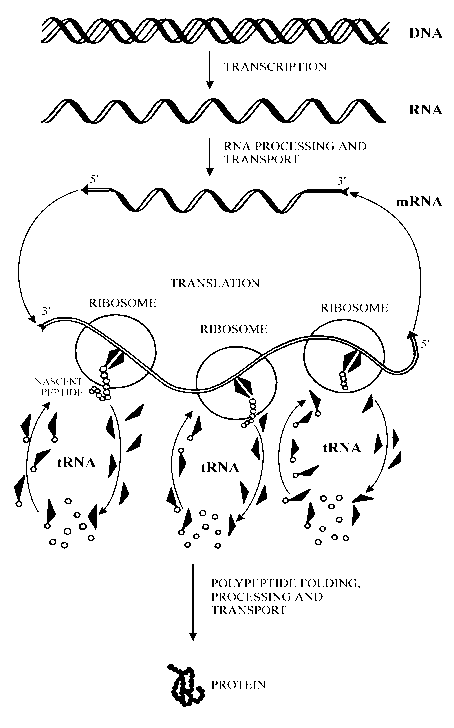 The fact of the resemblance of the specific shapes of rRNAs in isolated state and within the ribosomal particles suggests that the specific rRNA self-folding mainly determines the tertiary structure of rRNA in the ribosome as well. From the resemblance of the shapes of rRNAs and the corresponding ribosomal subunits it follows that the compact folding pattern of rRNA principally sets the morphology of the ribosomal particles.